For some it is about travel, about plunging oneself into new settings. For others it is about being—and knowing—home. For everyone it is the sense of place. This book is a collection of essays, memoirs, nature writing, and travel narratives that document the impact this sense of place has on writing. In locations as familiar as Cape Cod or Mesa Verde and as exotic as Kraków or Kyrgyzstan, thirteen accomplished writers of contemporary creative nonfiction share some of their most memorable work, disclosing how place alters our perception and influences our insight. 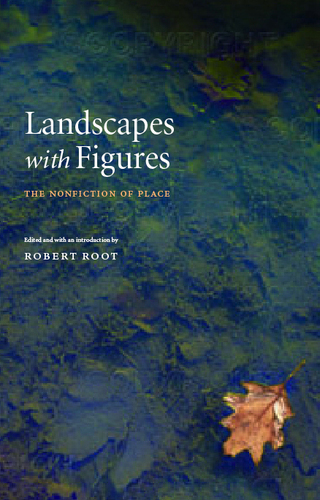 Taking readers to deserts and forests, islands and mountains, Landscape with Figures is an encounter not only with places but also with writers themselves. Each contribution is accompanied by a new commentary by its author discussing the relationship to place in his or her writing. The authors reveal the connections they feel to the places they write about, the role that place plays in the choices they make in relating their experiences, and the strategies and work habits that produce such writing. This compilation is simultaneously a wide-ranging anthology of the nonfiction of place for the armchair traveler, and a book about writing for those who aspire to understand and practice the craft, carrying with it the invitation to reflect on one’s own special places.